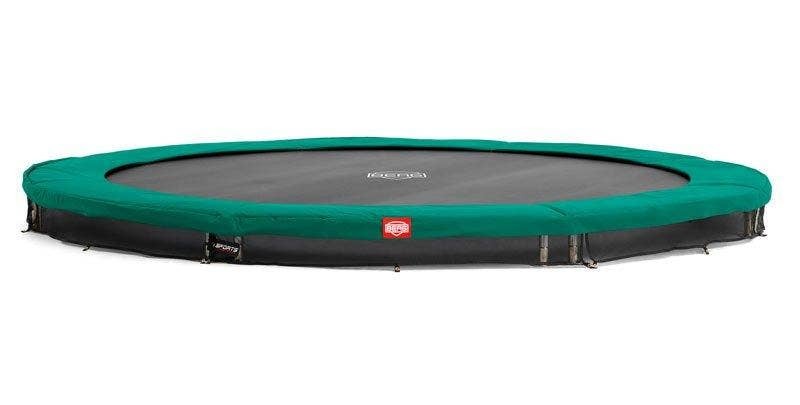 Rectangular trampolines have always been the choice for ultimate performance but until recently they also came with a big price tag. Now Skyhigh have introduced two new rectangular trampolines with enclosures that have amazing specifications at a low price, making the Skyhigh rectangular outstanding value for money. True to the Skyhigh trampoline brand ethos, the new rectangular models are guaranteed by the twin badges of trampoline quality, the 5T safety standards and the 5Q quality standards, ensuring that your trampolines are the optimum in safety and quality build. Skyhigh trampolines have the same number of springs as the most expensive trampolines, the same weight limits and the same warranties, yet the prices are much better. 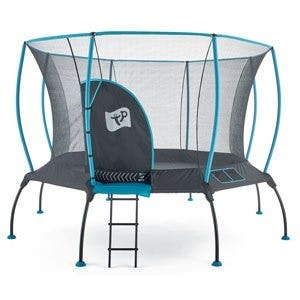 The Skyhigh safety enclosure keeps the netting inside the poles, within the frame of the trampoline and attached inside the trampoline pads; the safest method. The entrances are secured by clasps, not zips. 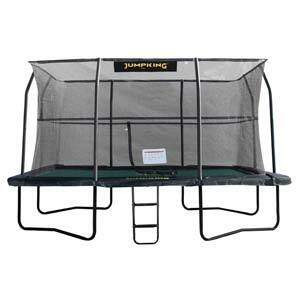 The Safety Net poles are attached to the frame of the trampoline with tool free U-Bolts for ease of fitting. 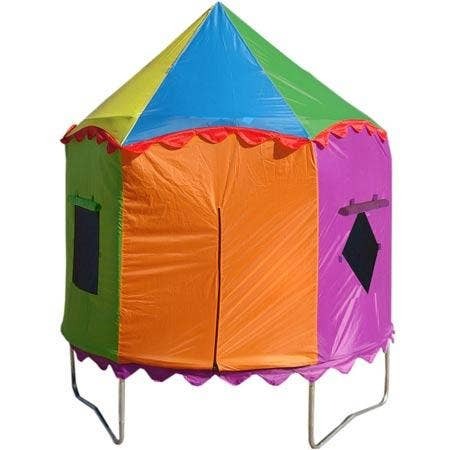 Skyhigh trampolines offer three grades of round trampolines as well as an Oval and Rectangular range. The Skyhigh entry level round trampolines are good quality and conform to all current safety standards. They are robust too, offering Skyhigh's T-Bar Leg Connection system (so nothing is welded) making it stronger and sturdier. The Skyhigh Plus round trampolines are the mid range selection from Skyhigh and were developed especially for those who want great performace and a lot more fun, without taking things as seriously as you would with a Skyhigh Xtreme 360 trampoline. The enclosure poles on this trampoline are decorated with a modern white flower pattern on a green background with yellow trim so not only are they fun to play on but they look fun too! 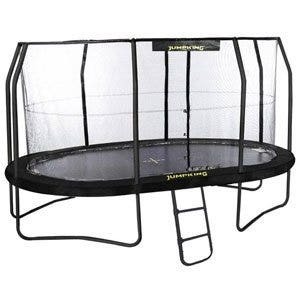 You can have confidence in the safety of this model as it has a higher spec frame than many of the higher end brands and the high quality pads and enclosure comes as standard with this range of trampolines. Finally the Skyhigh Xtreme 360 round trampoline is Skyhigh's highest range of elite trampolines. These trampolines have been created to give the highest quality and best performance out of the whole skyhigh range. Available in just two sizes - these trampolines have a classy powder-coated black finish to the poles and is more durable than many other trampolines. 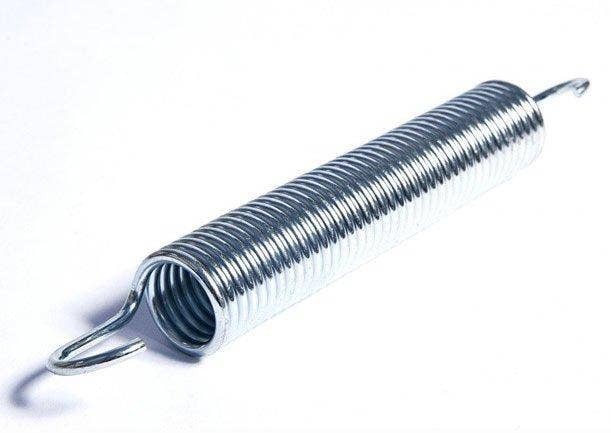 It also has more springs and each spring being a longer length means a high, better bounce. It also has extra thick padding, stronger frame and higher quality safety net. The Skyhigh Oval trampolines are also popular and offer high bounce quality, convenience and family-orientation along with excellent specification and warranties. 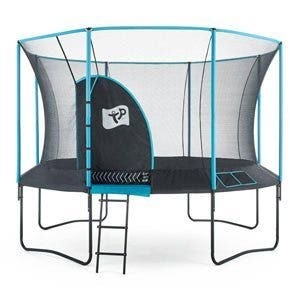 The Skyhigh Rectangular trampolines offer as close an experience as possible to gymnasium trampolines while still offering a fun home garden trampoline experience. Both the oval and rectangular trampolines offer a different bounce to the round trampolines as the straight sides with springs that point in two different directions stretch to different extents and work to different rates. This means that you will be able to cover the entire mat without being pulled into the centre, as is the case with round trampolines. The bounce is also more controlled and easier on your joints. * Free 3-5 day delivery applies to non-surcharge areas only.